There are hundred’s of ways to kneel and kiss the earth. 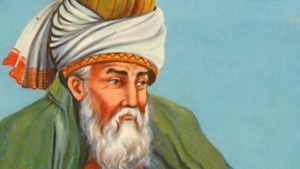 I know how popular he is: the great Sufi mystic poet Jal al-Din Rumi. And most of us have come to him through the versions or translations of American poet Coleman Barks. And I know that scholars can get quite touchy over how true Coleman’s versions or translations are to the original. That is a discussion for a another blog post. But today I want to share one of Coleman’s wonderful version of Rumi regardless of how well known it is or not or how true to the original. This poem has long been a favorite of mine. And I used it in a poetry therapy session on Wednesday and Thursday. This idea that we can get out of our heads and make our music in the world. And I am inspired by the idea that we join what we love to what we do. And that there are hundreds of ways of saying I am here, truly all of me here, on this earth! And now I continue to break a tradition of this poetry blog by sharing another poem I wrote this week. A good week for poems! I wrote this yesterday without any sense of what it might be. The first line came to me and I thought, ok, let’s go. I was not expecting Rumi to join me. Thank you Jala al-Din and Coleman! of all the exhales I can muster. but knees asking me to kneel. This entry was written by Richard Osler, posted on July 14, 2018 at 6:22 pm, filed under Poetry and tagged Coleman Barks, Jal al-Din Rumi, Richard Osler. Bookmark the permalink. Follow any comments here with the RSS feed for this post. Likewise. Your energy brought so much more to our week writing with Kaminsky! Thanks Devon! Loved your Hechct poem a few weeks back! Scary like your US politics. What does your historian husband make of all this?